In 1967 David Sainsbury set up the Gatsby Charitable Foundation and agreed its first grant – £50 to the Liverpool School of Tropical Medicine. David Sainsbury (now Lord Sainsbury of Turville) has since given Gatsby more than £1 billion to distribute to charitable causes. We have also supported significant programmes in mental health - in particular through the founding of the Centre for Mental Health - although we are no longer focusing on this area. Across all areas, we aim to be more than a funder. We act as an enabler for projects, designing, developing, overseeing and, in some cases, delivering activities. We are proactive in putting together projects to achieve our aims. Rather than wait for third-party proposals, we identify areas of need, commission research and design interventions in partnership with sector and industry experts. We take a long-term view as we do not think much can be achieved by short, one-off projects. We build long relationships with the organisations we support, allowing both them and us to learn from successes and failures and to develop sustainable change. We are particularly enthusiastic about supporting innovation. David Sainsbury has long believed that private foundations have an important role to play in testing imaginative models and new ideas that governments may see as too risky for public funding, even when they have significant potential to benefit the public if they succeed. Gatsby can incubate such models, giving them the support they need to prove themselves and build the track-records that will encourage others to scale them up. We are always looking to increase the impact of our limited funds, and are therefore eager to form partnerships with others who share our goals. In Tanzania, Gatsby is partnering with the government to transform the country’s cotton sector, while our multi-million pound partnership with the Wellcome Trust to create the new Sainsbury-Wellcome Centre for Neural Circuits and Behaviour shows what can be achieved by working together. 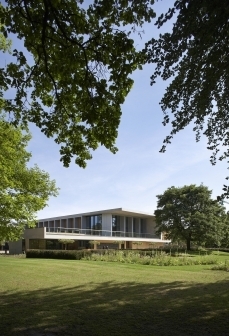 The Sainsbury-Wellcome Centre is one of several large-scale, capital-intensive projects where Gatsby has helped build institutions from the ground up. Other notable examples include the National STEM Centre, the Institute for Government, and the Sainsbury Laboratory Cambridge University – a landmark plant science research facility which opened in 2011. But Gatsby also continues to support smaller activities that are quietly equally transformative, such as commissioning reviews of the use of practical science in schools, and running summer schools to encourage undergraduates to study plant science further. We will continue to support and undertake both large- and small-scale work, employing different methods and models depending on the different challenges, but always ultimately looking to deliver long-term, sustainable change.